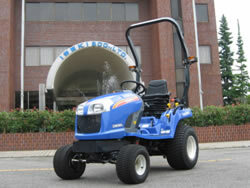 TXG237 is the convenient and versatile sub compact tractor. 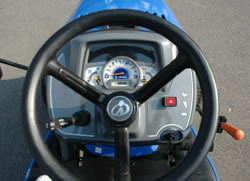 It can be attached with various implements such as mower, grass collector, front loader, sweeper, snow blower, blade etc. 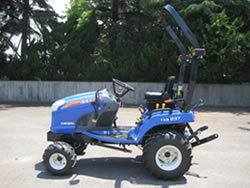 Its compact size, suitable horsepower and good maneuverability make TXG237 ideal tractor for various kinds of customers like municipality, landscapers, residential owner and contractor. 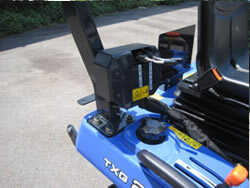 Wider floor and spacious operator's area with proper position of all levers and pedals offer comfort and less fatigue to operator for long work. Side by side two pedals of HST enable operator to change forward / reverse direction and speed easily. Deluxe instrument panel with LED back light provides good visibility for day and night time operation. Also, it consists of tachometer, fuel and coolant temperature gauges and necessary monitor lamps. The combination type of lighting switch like automobile is equipped with TXG237 as standard. Auxiliary hydraulic valves with floating position are factory option, which are very useful for various implements. Larger 25 liter fuel tank can contribute to longer operation and fueling is easy through the larger diameter of fuel cap.